This hearty stew is so full of flavour and nutrition you’ll want to keep it in rotation all winter long. It’s high in fibre, low in fat and contains 9 grams of plant-based protein per serving. 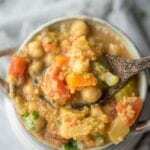 Quinoa and chickpeas are both energizing sources of carbohydrates and they taste amazing paired up with veggies and a curried coconut tomato broth. Add the carrot, celery, onion, garlic and ginger to a soup pot with a bit of the vegetable broth and cook for 5-10 minutes until starting to soften. Stir in the spices and cook for another minute. Add the broth, quinoa and diced tomatoes and lightly simmer for 15 minutes until the quinoa is cooked. Stir in the chickpeas, coconut milk and cilantro, turn off the heat and let it sit another 5-10 minutes. Serve right away or store in the fridge for up to 5 days or freezer for up to 3 months.